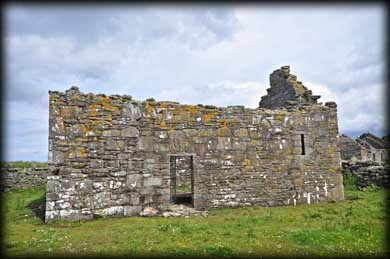 The first church I came to on Inishmurray was Templenaman - The Women's Church. It stands within the northern end of a small enclosure that encircles the women's cemetery. The church which is orientated East/West measures 8.6 metres long by 4 metres wide. The walls are made from rough coursed stone. The east gable, pictured below, has a broadly splayed single window. 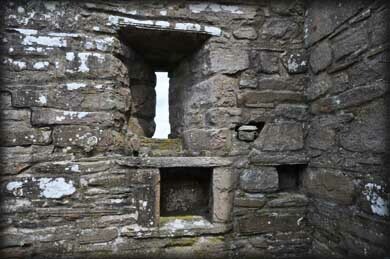 The present doorway is in the southern wall, but there is an older, blocked up, doorway in the west gable. 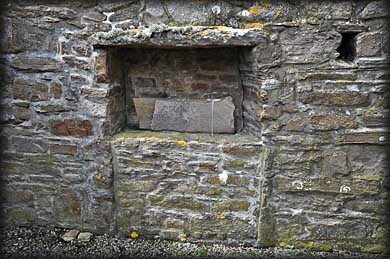 There were several cross slabs found at Templenaman; some of these have been removed to the old schoolhouse for protection. One of the stones indicated a connection to a servant of St Brigid, which may suggest nun's burials. Situated on the outside of the north enclosure wall is a beautifully decorated 1.45 metre high cross pillar. The west face bears an incised cross with arms terminating into a triangular serif. 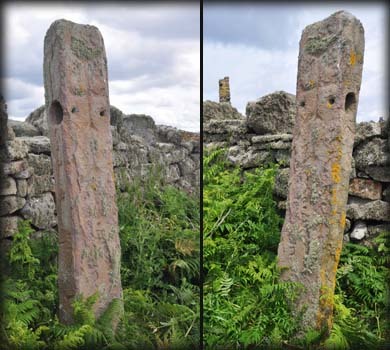 In the lower quadrants are two small holes that link to larger holes in either side of the pillar, very similar to the birthing stone situated inside the cashel. Below the cross are the remains of two, possibly three vertical inscriptions. The west face of the cross pillar is pictured left. 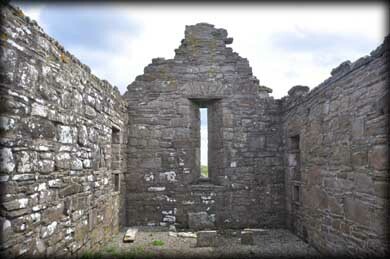 Situated: This church is located in the women's Graveyard west of the cashel. Discovery Map 16: G 5746 5379. Last visit June 2012.